Imagine a world with monsters with strange powers locked in our mental institutions to protect the public and study them. Now imagine those monsters broke free and lived in the sewers under your city. Well, with Above you don’t have to imagine because it’s exactly what you get.. from the monsters’ perspective. Above is another book I have mix feelings for. 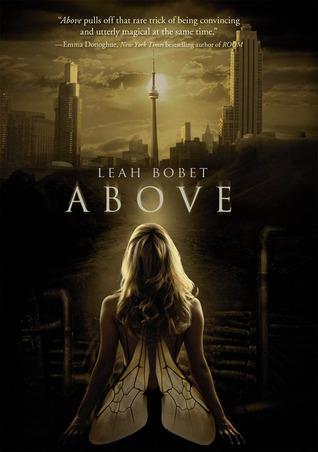 Leah Bobet is a Canadian debut author, Above is a dystopian book and it has this insanely pretty cover. From the moment I heard of it, I’ve been wanting to read it. Yet when I started reading, I quickly realized in wasn’t quite for me. The writing is very peculiar, which isn’t a bad thing, I mean I appreciate original writing style as much as the next person, but I found that Bobet’s particular style didn’t work for me. The style really confused me from the get go, and add to that the fact that we don’t know the main character’s genre or name until page 31 and I left like, I too, was lost in a dark sewer tunnel. As you can see Above and I didn’t start on the right foot, but I kept on reading because I really wanted to like the book! As I read on, I got used to the writing style and it improved my enjoyment on the book. Leah imagined a fantastic world, close enough to ours to be believable but with so much more under the surface, quite literally. Some people are born with defect such has fish gills and lion feet, other develop into weird creatures with time. For example, crab arms or powers over electricity or even more subtle gifts like ghost talking. Those people were feared an locked away, but some escaped and formed a Safe community underground, surviving and protecting each other as best as they could, living with an immense fear of Above. The idea is that much more original because the story is told from the monster’s perspective. It’s really a great story about discrimination, fear, but also courage, strength and love. It’s about a small group of people trying to overcome challenges, fighting for safety in a world that wants the shun them out, forget they ever existed. Bobet created a wide spectrum of characters, old and young, born Above and in Safe, male and female, all with different imperfections, providing an array of personalities among its rank. While I appreciated the diversity, I didn’t feel any connection with any of them, which really hit my enjoyment of the novel. Matthew and Ariel, the two main characters, were both weird and I had a hard time understanding their decisions. It’s evident they care for each other, but their relationship is very awkward. It’s beautiful in a way, but it wasn’t for me. The plot line was good enough. The people from Safe were sent running when their Sanctuary was invaded by monsters worst than them and they fought as best as they could from Above, a world they don’t know, to retrieve their haven and uncover the mystery being those terrifying creatures. What I liked the most about this novel is the butterfly effect Leah Bobet sneakily included in the book. She showed that every decision the characters make, even the ones that seem insignificant, have a huge effect on their own future, but also on everyone around them. The conclusion being the apogee of the whole concept. I've been dying to read this book.I didn't know it was told from the monsters perspective.